Is Church Membership Like a YMCA Membership? Read moreIs Church Membership Like a YMCA Membership? Crazy good day with North Side. We finished up John 9 in “Knowing Jesus” with the man who once was blind but now can see. For a bluegrass section at the end of the service, I was even able to talk Jeff into playing banjo with us at the end. So, so good. In addition to preaching a fantastic sermon today, he also played some mean banjo. What a fantabulous day at North Side! 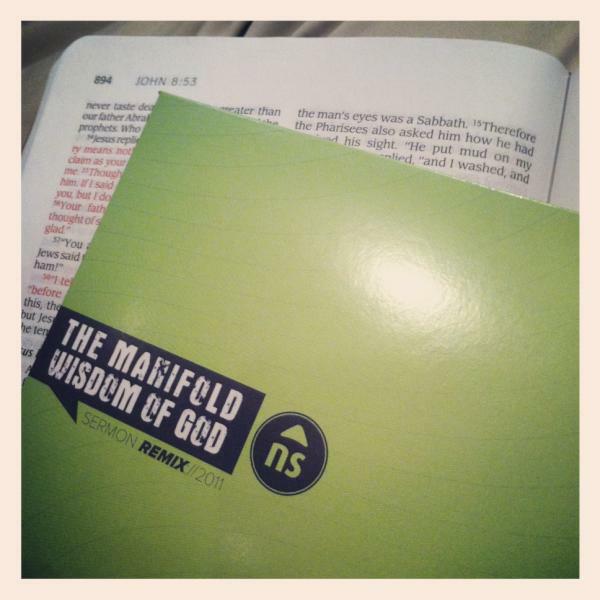 We were thrilled to release our new album “The Manifold Wisdom of God: Sermon Remix 2011” (photo courtesy of Taylor Wolfe). While I couldn’t talk Jeff into doing his part live, the band did accompany his preaching. We played track #10 off of the album which is in my top 2 favorite tracks. Thank you for all that got copies today. I loved hearing about the lines at the bookstore! Hope the biblical truths are impacting you today!